This secure tablet floor stand lets you set up a tablet as an interactive marketing kiosk or product display. It supports an Apple iPad, iPad Air or other 9.7" tablets.This TAA compliant product adheres to the requirements of the US Federal Trade Agreements Act (TAA), allowing government GSA Schedule purchases.Set up a single tablet in the lobby or use multiple stands throughout your organization or tradeshow display, to gain maximum exposure and impact. You can use the stand for applications, such as: Giving customers instant access to new product information; Welcoming visitors; Connecting customers to your own app to enhance the user experience.The Home button is covered, allowing you to direct users to specific information or apps and preventing them from navigating the tablet at their leisure.The secure tablet stand features a lockable holder that helps protect your tablet from loss or damage. Plus, you can screw the base of the steel and aluminum stand into the floor, to create a fixed-in-place holder.Design an impressive display unit for your tablet, in either a portrait or landscape position. The stand has a fixed height of approximately 42" (1060 mm) and features built-in cable management to ensure a tidy display. To power your tablet, discreetly thread the tablet's charge cable through the pillar-style stand. Maximum Adjustable Stand Height 42 in. Just imagine the many ways you could use a self-standing tablet in your organization. Welcome visitors with an impressive video or slide show. Give customers instant access to new product information. Or, connect customers to your own app, to create an engaging user experience. 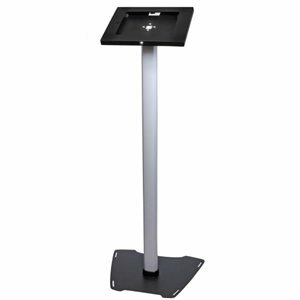 The tablet floor stand for iPad provides an impressive way to interact with your customers, and collect customer data. It’s ideal for lobbies, trade-show booths, retail environments and information kiosks. You can use multiple stands throughout each business location or tradeshow display, to gain maximum exposure and impact. Your iPad kiosk can alert customers to special sales. It can promote special menu offerings for restaurant guests, or allow hotel patrons to reserve seating or rooms. The applications are virtually limitless. The tablet stand features a lockable tablet holder for increased security and a base that you can screw into the floor to create a fixed-in-place holder. The stand’s robust steel and aluminum construction provides long-lasting performance with maximum protection and stability. The STNDTBLT1FS is backed by a 2-year StarTech.com warranty and free lifetime technical support.